Looking at the above quotation, (taken from a writing nearly two thousand years old), ought to bring—at the very least—a small bit of respect and attention to the matter of safety as it pertains to wood toxicity. If this subject has been known and reported as “ascertained fact” since ancient history, how much more ought we to take heed in modern times, considering that we have so many more well-developed means of communication and testing? 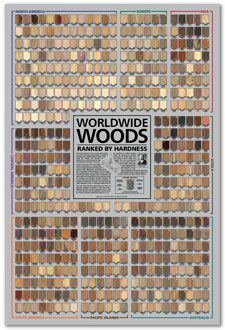 Just because any given wood is not listed on the chart, does not mean that it is completely safe to use. It simply means that adverse reactions have not been reported as of yet. (The wood may be very obscure or unknown.) One helpful thing to do if you have confirmed that you’re allergic to a specific species of wood, is to check for related species (listed at the end of each wood profile page). Many times, a wood in a particular genus will share similar allergic compounds with other related woods, resulting in cross-reactions.) For example, Cocobolo is in the Dalbergia genus, and is also closely related to other woods such as Kingwood, Tulipwood, Honduran Rosewood, etc. Also, you may notice two wood types that sound like they’re related, such as Black Cherry (Prunus genus) and Brazilian Cherry (Hymenaea genus), but they are actually quite unrelated. A common question: is this wood safe to use as a plate/bowl/cutting board/etc.? Despite the very long list of woods below, very few woods are actually toxic in and of themselves. But what a great number of woods do have the potential to do is cause allergic reactions in sensitive individuals. This risk for finished wood projects is greatly lessened (but not eliminated) with the application of a food-safe finish. In the end, using almost any wood is a calculated risk, and the question boils down to this: how much of a potential risk am I comfortable with? 1 in 10? 1 in 1,000? 1 in 1,000,000? Timbers & Health, Woodturners Society of Queensland, Inc.
You’ve probably already heard the term desensitized—usually in reference to violent movies or images—meaning that we start off as naturally being sensitive to something, and upon more and frequent exposure, we become less and less sensitive to its effects. Well, with some woods that have been classified as being a sensitizer, the opposite is true: the more we are exposed to a wood’s sawdust or other fine particles, the more sensitive we get to its exposure, and the more severe and adverse the reactions become. Hypersensitivity pneumonitis (also called extrinsic allergic alveolitis, EAA) is an inflammation of the alveoli within the lung caused by hypersensitivity to inhaled organic dusts. HP on PubMedHealth. Nasopharyngeal carcinoma, or sometimes called nasopharyngeal cancer. Basically, it is a cancer of the upper area of the pharynx or “throat,” where the nasal passages and auditory tubes join the remainder of the upper respiratory tract. NPC on MayoClinic.com.